The Rev. Gary Harpel, in the foreground at left, and, from left, David Rice, Paul Hyatt, 12-year-old Danilo of Nicaragua, and Wendell Qualls prepare the dirt floor for a one-room church in Guadelupe, Nicaragua. The men were part of a mission team from First Baptist Church of Durango who visited Nicaragua at the beginning of the year. Song, dance and hard work were the themes of a First Baptist Church of Durango mission to Nicaragua last month. First Baptist Church of Durango started off 2009 by sending nine people to El Rosario, Nicaragua. The team was led by Jim and Denise Hugins, who have spent several years going to the country on missions. "Our team's goal was to share God's love in tangible ways," said Lynn Kuntz. "We served wherever the local church needed help - working with orphans, Vacation Bible School for neighborhood children, food distribution to the poor and construction projects." Other team members included First Baptist's associate pastor, the Rev. Gary Harpel, his wife, Lynn, Wendell Qualls, David and Beth Rice, and former Durango resident Paul Hyatt. Kuntz and Denise Hugins served as interpreters. On the first morning, the women went door to door, inviting children ages 2 to 12 to Bible school. "We felt like Pied Pipers as dozens of kids joined our procession," Kuntz said, "skipping alongside us down the dirt road to 'Las Mangas,' a sunny field of scruffy, untrimmed weeds in the heart of the barrio." About 50 children joined them each day for lively songs, Bible stories, arts, crafts and games, as well as what Kuntz called a message of hope and love. During the afternoons, the women traveled by bus to an orphanage, where they dish-ed up another round of Vacation Bible School. While the women were with the children, the men on the trip were involved in the sweaty labor of building a one-room neighborhood church. 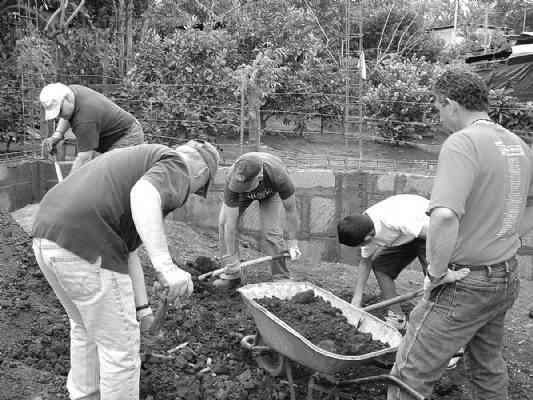 They worked with Nicaraguan church members, creating a partnership that wasn't built through shared conversations but through shared labor. Because of the generosity of Durangoans back home, the team also was able to purchase bulk rice and beans, which they bagged in 18-pound sacks and distributed to more than 100 of the neediest families in the barrio of El Rosario. After the final count, the group had distributed 3,200 pounds of food and had given the local church enough money to buy another 2,400 pounds of food, 2½ tons of food in total. The group also paid for all of the construction materials. Kuntz talked about distributing the food: "Visiting their homes, which often consisted of little more than a single room patchworked together with rusted tin and timber over a dirt floor, and praying with them, as they often requested, was one of the greatest blessings, and most humbling experiences, of the trip." The group also enjoyed the hospitality of the two local pastors, who treated them to Nicaraguan home cooking, including gallo pinto, a local Nicaraguan specialty of flavorful beans and rice, and fried plantain chips. "Over and over, gracious Nicaraguan brothers and sisters told us our visit had blessed them," Kuntz said. "Perhaps the most heartfelt Spanish phrase our team learned was 'La bendición es nuestra' - the blessing is all ours."